Bet you can't get these tunes out of your head. Raise your voices and let the fun begin. Karaoke night will never be the same. What's your ear worm? Do you like poetry? Are you the budding Wordsworth or Keats of the canine world? Do you think in iambic pentameter or dream in haiku. If you have ever scribbled a poem on the back of a show schedule while waiting in the car park for your go or written a verse to show how you feel about your dog, you are not alone. With the emphasis on natural healthy eating, it is not surprising that many agility people looking for ways to feed their dog with nutritious and reasonably priced food rather than shop-bought pet food. The best way to know what goes into your dog’s food is to make it yourself. Why take a chance? Make your dog's food yourself. It's not as difficult as you expect. 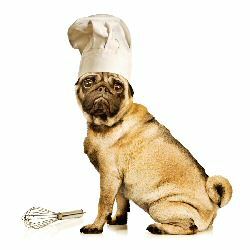 You don't have to be a Master Chef, Gordon Ramsey or Jamie Oliver to cook up something tasty for your dog. Here is a selection of home-made treats and special diets that you can try at home. For those people whose dogs have renal failure or need special diets, there are also tried and true recipes for you. Clever sayings about agility from clever handlers and instructors. Agility people may be better at navigating a course than writing a story but, thanks to social media, most of us have a chance to say what we think and share our acquired experiences. This is a place where you can express your personal opinion. It's what we're here for. Put pen to paper - or fingers to keyboard and send us your ideas. Ten short stories, beautifully observed, written by The Agility Whisperer, the Garrison Keillor of British Agility and illustrated by Kim Blundell. Sit back and enjoy the gentle humour, charm and honesty of these delightful insights into agility. Stephanie King wrote this fiction story, in the Janet Evanovich school of writing and dedicated it to Jesse, the best friend and dog warden a girl could ever ask for. Not to be read before the 9 o'clock watershed. 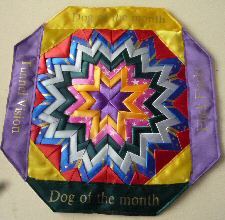 Lots of us have dusty black bags full of rosettes in our lofts which we can't bear to part with. But what can you do with them? Helen Walland has come up with a crafty way of displaying past successes.